This year, we at RETOS celebrate our 25th anniversary, although the roots go back in history even further. The drawing of the premises shows a plan of the Plauert company from the beginning of the 20th century. If you look at it closely, you might recognise some of the buildings. But not everything has been realised precisely in that way. The company „Arno Plauert Maschinenfabrik“ is the beginning of Varnsdorf’s history of horizontal boring mill production and thus also the beginning of our company’s history. Back then in 1903, Arno Plauert acquires ownership of a small engineering factory in Varnsdorf and changes the company’s name into „Arno Plauert Maschinenfabrik“. In 1915, the first horizontal boring and milling machine is manufactured. In 1917, the company moves into the new manufacturing premises, the current premises of RETOS. During the Second World War, the manufacturing goes on; and the company survives. Thereafter, there are various mergers. At the end of the 1940s the independent company TOS VARNSDORF a.s. is founded. Owing to the development of new machines, the company is temporarily doing well, but during the 1980s the productivity and the number of employees is gradually decreasing, leading to a subsequent demerging of smaller private companies at the beginning of the 1990s. Emerging from the department of overhauls, the retrofitting, the “JAN MÜLLER, RETOS” company is founded, in 1993, finally becoming RETOS VARNSDORF s.r.o. The company stays at the premises planned and realised by Arno Plauert. The original mansion of Arno Plauert, which was during the communist government a kindergarten, is now used as an office building. Jan Müller, this name is lasting, too. Ing. Jan Müller (junior), who had already been working as the head of the engineering department in RETOS, took over the function of the Managing Director from his father, the founder of the company. Thus, long years of experience and professional knowledge were directly passed from father to son. We at RETOS still perform overhauls and build on this experience. However, due to changed requirements of the market, such as funding for new machines, we had to struck out in a new direction. In 2004, the conventional W100A boring mill is taken over from TOS VARNSDORF a.s. This first new machine produced by RETOS is linked with the family history. After the Second World War, Karol Matovič, the Managing Director’s grandfather and a very important and successful designer of TOS VARNSDORF a.s. improved the reliable, but highly complicated W100A headstock, which is still produced in the same way. 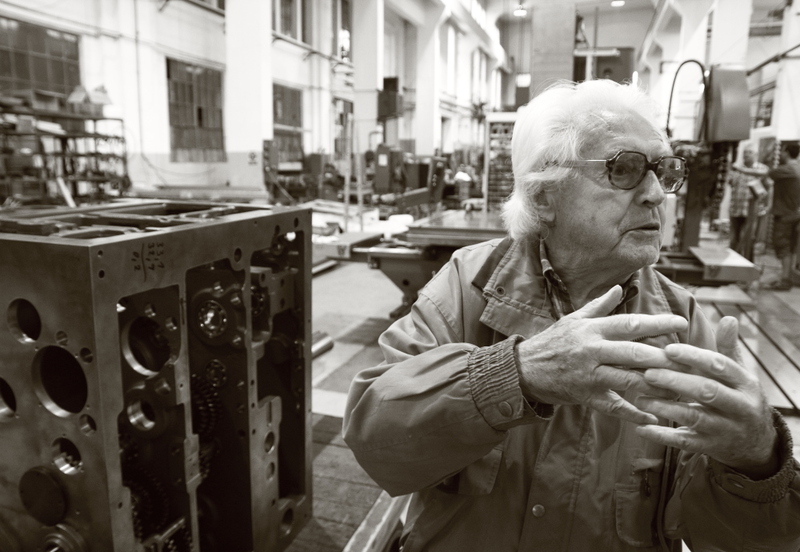 On the photograph, you can see how he, at an age of over 90 years, proudly talks about this task and the operating principle of the headstock with its gears during a visit in the assembly hall. Even though the demand for this machine is still unbroken, a conventional boring mill cannot be enough in the long term. Therefore, a CNC version is developed, at that time called W100B-CNC, now RET100B. The two machines form the 100AB series of table type horizontal boring mills with a maximum of identical components. However, the next series is already worked on. First, a floor type boring mill, the WHP10-CNC – now the RET10P – is developed. It has an X axis travel range of up to 12 m. In 2016, the second machine of this series is launched, the RET10X T-type boring mill. The unit principle of those two machines and the wide range of accessories result in a maximum of customisation. So, the 10XP series offers X possibilities. The plan did work out. The new machine types are very well accepted. Additionally to the flexibility, the new modern design and the new colours, which have also been introduced in 2016, as well as the economic growth in the sector certainly had a positive influence, too. In the year 2018, the year of the 25th anniversary, the total sales figures markedly increased. The new series has been particularly successful in Germany. For the year 2019, further orders have been placed. We do not only produce and sell, but we consider our company as a permanent partner. We offer sophisticated technological consultancy, laser measurement and optimisation of the geometric accuracy of the customers’ machines, service within and after the warranty period, we sell spare parts and accessories and, of course, we perform overhauls and modernisations – and that for machines all over the world. Thus, we can considerably increase the utilisation period of our machines. And we are optimistic about continuing in doing so for many years.